The centre of what would become HaNoi (or ‘inside the river’) would shift around a number of times – but the city as we know it today was established in 1010. For most its history Hanoi has been either the capital, or the most significant political centre of Vietnam – and it remains the country’s second largest city. Many of its streets are dedicated to specific trades – for example goldsmiths might line a block, with every store-front belonging to a separate smithy … or ‘bag street’, where each shop sells bags – and nothing but bags. The streets around this corner sold clothing and material (to the right), local food stalls and tourist services like day-trips to the left. 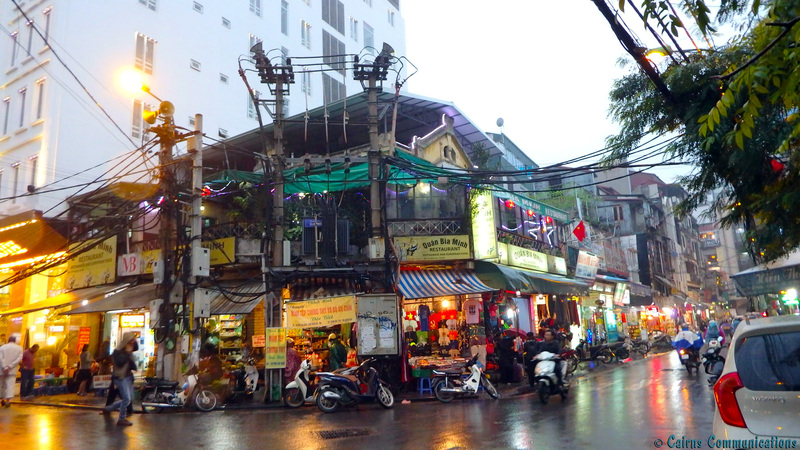 The first hotel we stayed in in Hanoi was in ‘Shoe Street’. And there were motorbikes EVERYWHERE. Not just on the roads – but parked on the footpath, inside the shops, jammed next to the cooking pots … I was told that there were actually 5 million motorbikes in Hanoi – that’s one bike for every 1.75 people. But latest figures from the MOT suggest that the number’s climbed to seven million – or one scooter for every man, woman and child in the Greater Hanoi region.